Yet another great thing to do in lovely (rainy) April is to go to the flea market! Around where I live there are flea markets you can find to attend all over the place most weekends, but the one I always LOVE to go to is the Kane County Flea Market in Geneva! “Where there’s muck there’s money”- the wise words of my mom. Clearly, she isn’t a huge fan of thrifting and of flea markets but I love them entirely. There are TONS of things to see, purchase and make your own and with all types of people. I’m a lover of antiques and the things you can find at flea markets most of the time fit that ideal! The flea market is open every first weekend of the month. 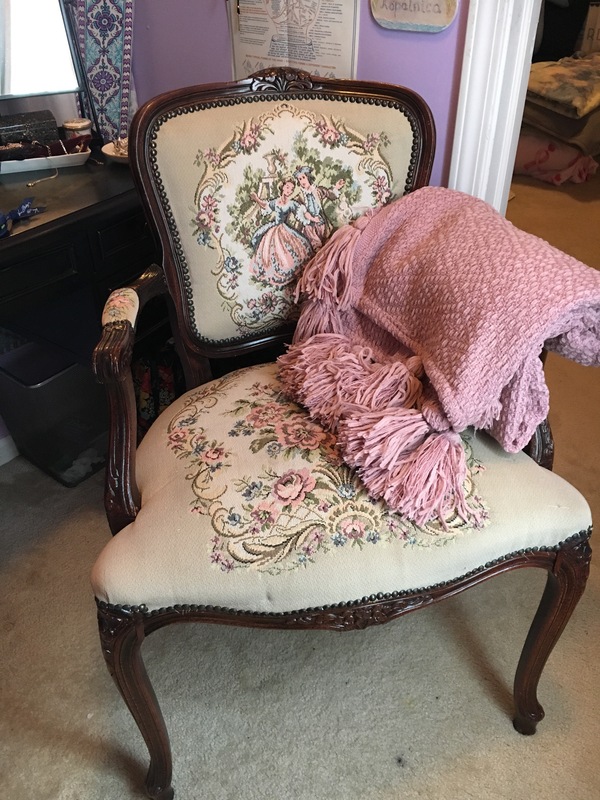 Although just recently have started going, I have already found the chair of my dreams and some magical Disney pins along the way! There are items at the flea market that you can repurpose to create that farmhouse chic style in your home, or that quacky and whimsical addition. Little did I know, on one of the stands there is a man and woman who attend this flea market April, May, and October who sell Disney trading pins for SO cheap! I’m talking new Disney Parks pins and old high quality collectors pins for as low as 3$! I got 4 pins for 10$ this last time I went and I’m SO pleased with them as have great character to add to my pin board, (I wish I got more!). The first time I went was back in February and I bought that lovely chair I told you all about. It’s almost like a Victorian/french country chair that I absolutely love. You know that feeling you get when you feel emotionally attached to an inanimate object? -that’s how I felt about this chair. The chair itself has old mahogany wood trimming which have been scuffed up due to use, which makes it have character and that antique feel. The upholstery has a Victorian/french feel to it with the design of a woman with blush pink and pale blue detail. I paired it with a pink throw pillow I got from home goods and I cannot wait to make it a statement piece in my bedroom when I live on my own! The chair itself I paid $30 for and I think that’s SUCH a bargain seeing as it’s everything I’ve ever hoped to find in a chair. The chair fits my personality so much and I couldn’t have found anything better!